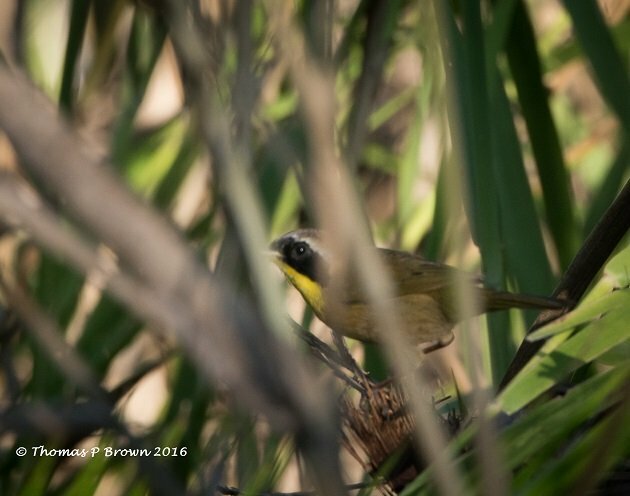 I recently wrote a short story here on 10,000 Birds about one of our endemic species, the Belding’s Yellowthroat, Geothlypis belding beldingi. and its status on the Threatened Species List. Todos Santo, an ocean side village, is a 56 mile trip, west across the Baja to the Pacific Ocean side. At the edge of the ocean, and town, there is a brackish water lagoon, and this is where our story plays out. Todos Santos has long been a sleepy little village, with a few fishermen, and a decent wintertime surf break. Over the last decade or so, this community has drawn more and more full time US and Canadian residents, most of which would be considered artists and musicians. Galleries, boutiques, custom jewelry shops and small restaurants are now the bulk of the commercial trade, along with the world famous Hotel California. With this growth, and increase in full time residents, has come a demand for homes, many of which are located right on the beautiful white sand beaches. Up until recently, the only environmental issue that has been found news worthy has been the protection of the large number of sea turtles that come to these beaches to nest. 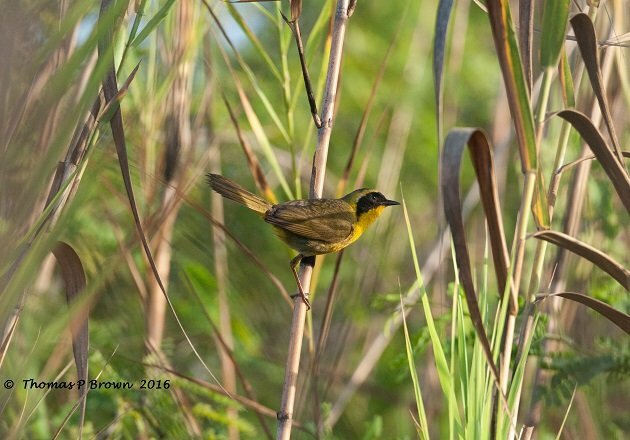 Little has been said about the small yellow bird which lives in the marsh grass and reeds of the Todos Santos Lagoon. 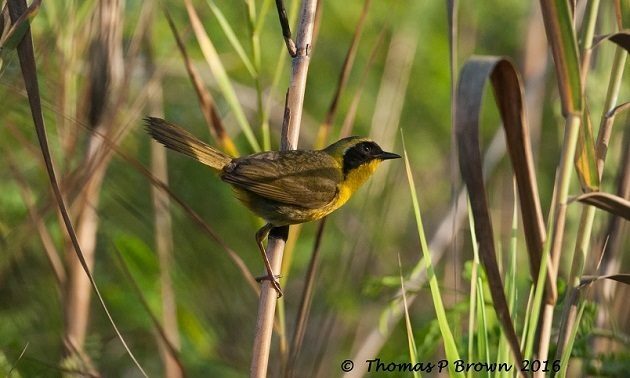 A few year back I was made aware of the growing need to protect the Belding’s Yellowthroat by Bryan and Sergio Jauregui, owners of the Los Colibris Casitas, which are located high on the ridge, above the lagoon. With the encroaching homes, and the dramatic increase in demand for water, this lagoon is in dire shape. Just last weekend, I was able to go back to Todos Santos Lagoon, which is one of the last remaining locations that the Belding’s can be found in any real numbers. In speaking with Bryan, she mentioned that it had been some time since a single Belding’s had been spotted, especially since their was virtually no water flowing into the lagoon any more. The native reeds and marsh grasses were dying out, and the Belding’s habitat going with them. My time here was limited, but I wanted to give every effort to see if I could locate some of the Belding’s, in hope to dispel the idea that we might have seen the end of this bird for the Todos Santos Lagoon. With a couple of hours left in the day, I wandered thru the all the spots that I had seen them before….zip, nada nothing, not even one bird. This was not looking good. At daylight the next morning, I was back in the swamp, me a couple million mosquitos, and even more tiny little “No See ‘Ums”. I poked along slowly, until finally, there they were, 6 Belding’s Yellowthroats. I was over joyed! As many of you might know, trying to photograph small, fast moving birds in swampy, tall reeds, in clouds of insects can be a real challenge. I did manage to get a few decent images, but nearly every one of them has a stick or reed right thru the eye or across the head. All in all, I saw nearly 20 of these fast moving little balls of yellow feather. Here is a good example of shooting thru the reeds. Now, I am home, and looking at the photos…..and it dawns on me, that these are not Belding’s Yellowthroats, but in fact Common Yellowthroats, Geothlypis belding scirpicola. The Common Yellowthroat is not known to be this far south, and rarely if ever share the same territory as the Belding’s. 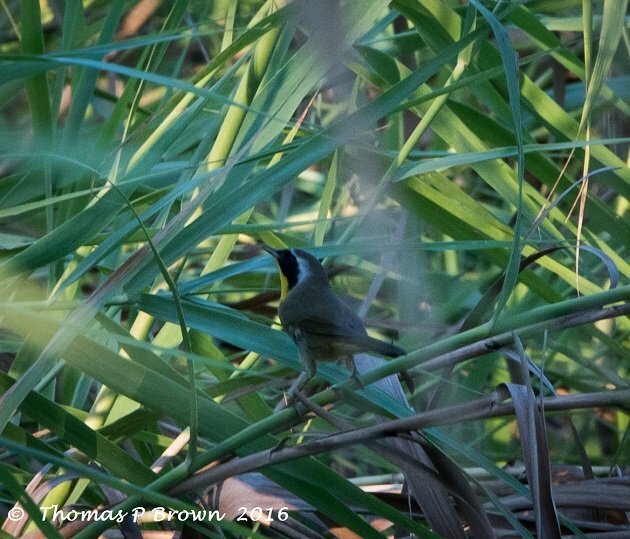 While this was a nice surprise to find them so far out of their normal range, I am quite disturbed at not finding a single bird that I could positively identify as a Belding’s Yellowthroat. You can rest assured, I will be back, and soon, to see if this marks the end of a beautiful bird in the Todos Santos Lagoon. Here is the Belding’s, distinguished by the lack of white above the black mask. This image was captured over a year ago. 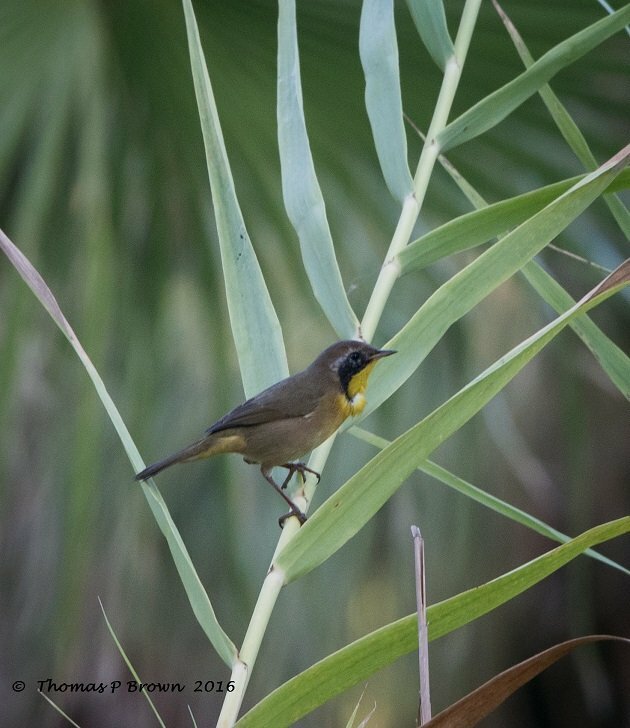 Below is the male Common Yellowthroat that I captured on Sunday Morning. Here is a juvenile Common Yellowthroat.